Many people will want to go on a guided trip, and there are now three guide services permitted by the National Park Service. Each company does the trip a little differently. 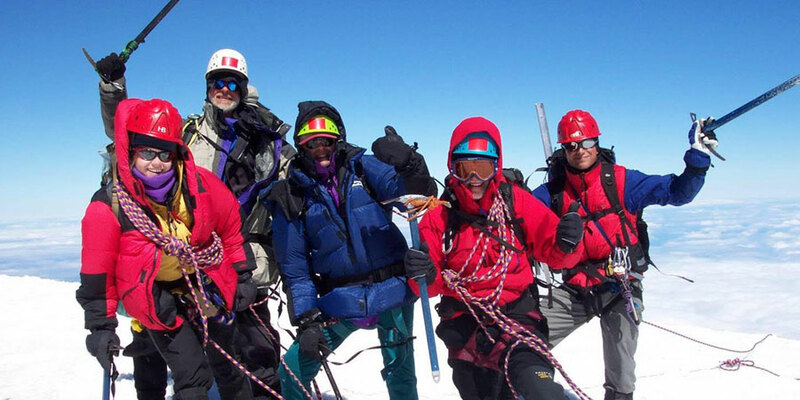 Most climbers will take 2-4 days, depending on which climbing route you chose, and which guide service you go with. If you want to sign up for a guided climb, do so early…it is normal that the guided climbs will be virtually filled up by September for the following summer! 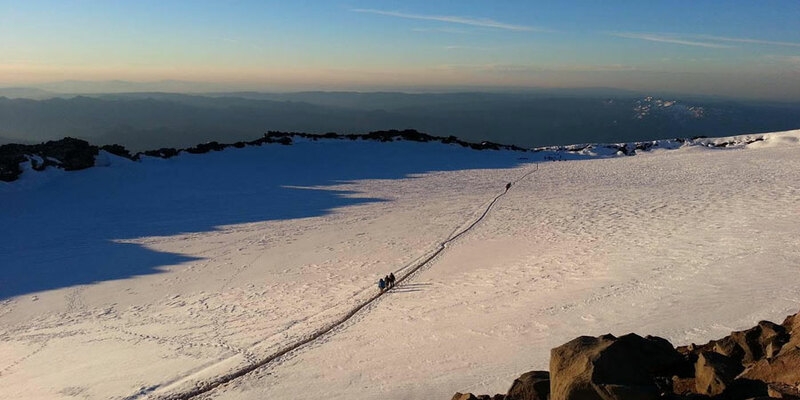 The most popular route is from the south, via Camp Muir (10,000’). This route ascends the Ingraham Glacier and Disappointment Cleaver to the summit. Some of the guide services add an additional night on the mountain, at Ingraham Flats (11,000’) to make it a bit more relaxed (though still hard!). 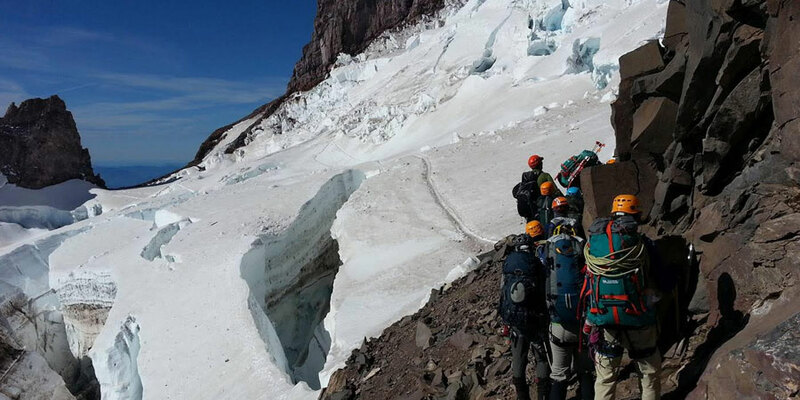 The second most popular route is longer, starting from White River Campground on the northeast side, and ascending the Emmons Glacier via Camp Schurman (9,600’). Regardless of the route you chose, you will also need to learn how to use of your ice axe, crampons, and ropes for safe glacier travel. It is a long and strenuous climb, which is quite difficult for many people. You can’t be in too good shape…the more you train, the more you will enjoy the climb! 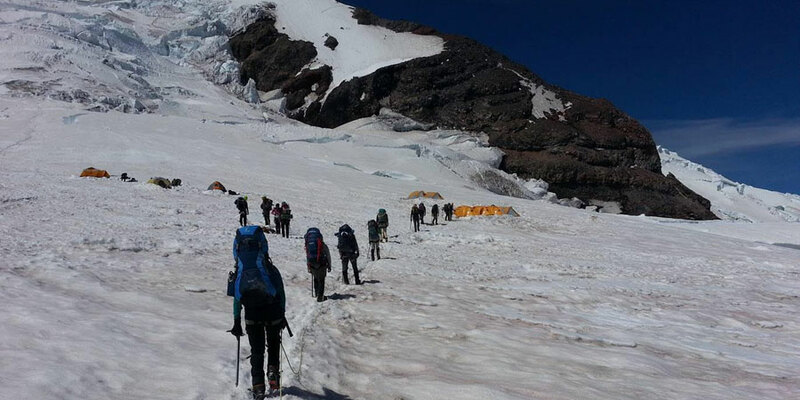 IMG climbers at 9500 feet on the Muir Snowfield, on the way to Camp Muir for the 3-day climb. Camp Muir is just coming into view, only a half hour to go! 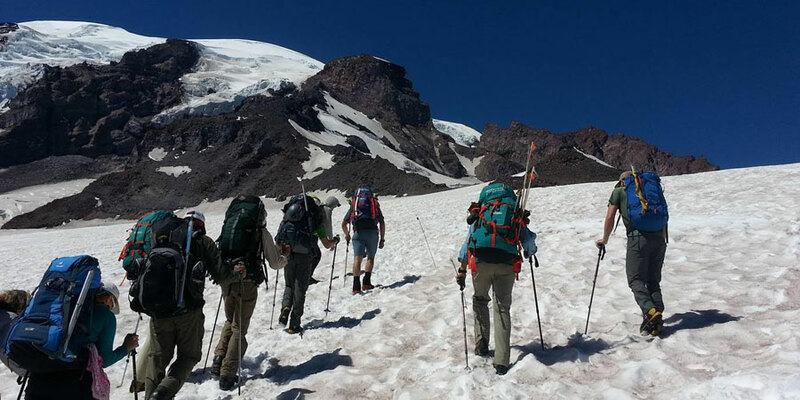 For future climbers, the hike up the Muir Snowfield to Camp Muir (10,000’) is a great training hike. Start early in the day and carry the right gear! Hanging out at Camp Schurman (9600 ft) with the Emmons Glacier rising to the summit. Emmons climbers will usually spend two nights here, one before and one after the climb. The Emmons is normally a 4 day climb, with the first night at about 8000 ft on the Inter Glacier. 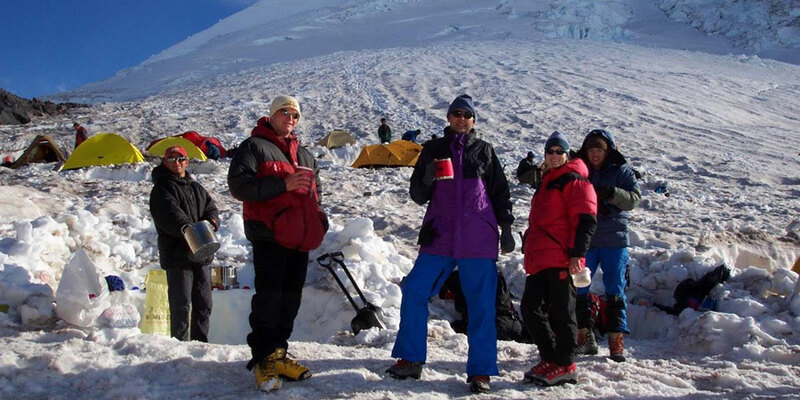 Climbers arriving at the Ingraham Flats Camp. Time to do some eating, drinking, and resting to get ready for tomorrow. You will be climbing Disappointment Cleaver, in the background, in the dark! Crossing from the Cleaver and onto the Ingraham Glacier is a tricky part of the climb. Don't stop, keep moving, there are lots of rocks and ice above you! 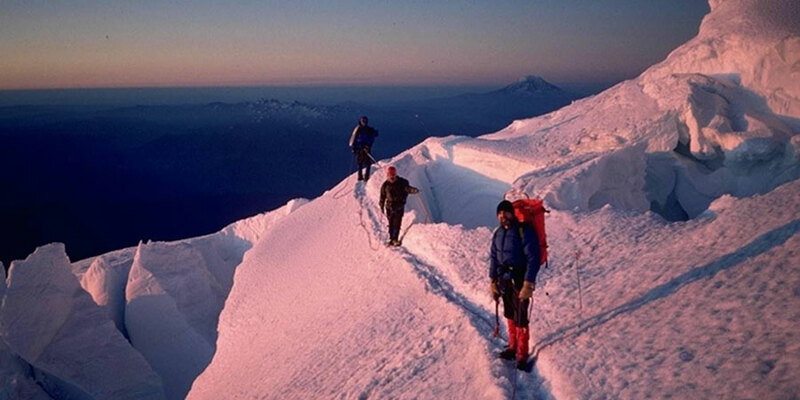 High traverse at sunrise 12,500 feet on the way to the summit of Mt Rainier. Goat Rocks and Mt Adams in the distance. The route to the summit works around many crevasses along the way. Getting close to the crater, 13,700 feet on Mt Rainier. Breathe hard and keep grinding! Climbers crossing the East Crater, a few minutes below the Summit. You are almost there! Windy day on Columbia Crest, the 14,411' true summit of Mt Rainier. 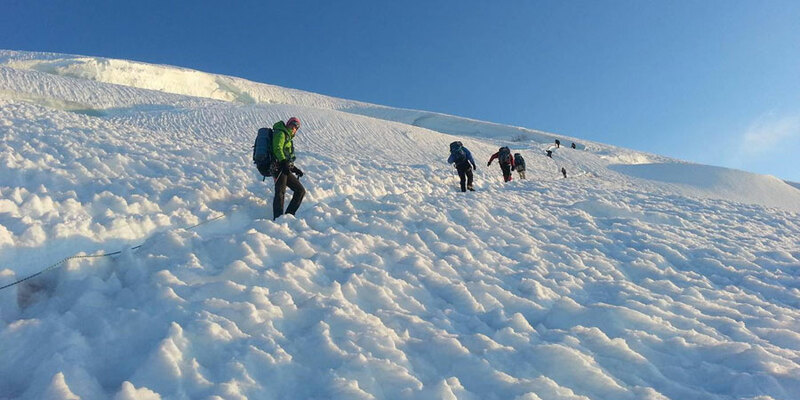 For average climbers, figure 10-12 hours from Muir to the summit and back to Muir. 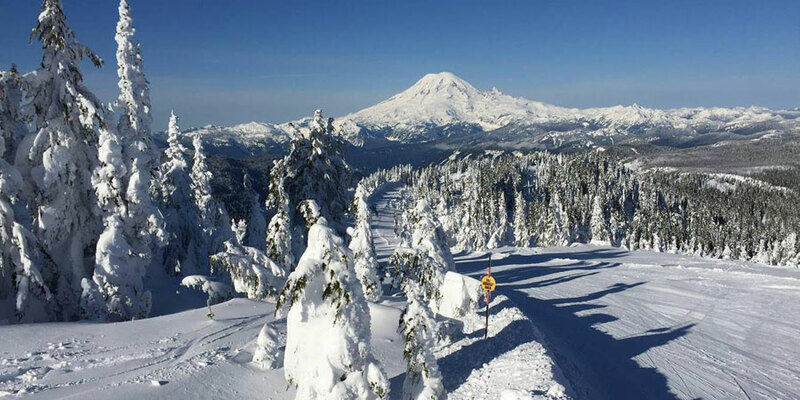 Climbing Rainier is one of the classic human powered adventures in Washington State. There are three main guide services permitted by the National Park Service, and each company does the trip a little differently. Most climbers will take 2-4 days, depending on which climbing route you chose, and which guide service you go with. If you want to sign up for a guided climb, do so early…it is normal that the guided climbs will be virtually filled up in the Autumn, for the following Summer.